Liverpool youngster Sheyi Ojo compiled the misery on Man United this evening, as he puts the Reds 3-1 up against the Red Devils with a very well taken penalty. The goal, which came around 17 minutes from time, is Ojo’s first in pre-season, and is one that he most likely won’t forget in a hurry seeing as it was agains United. Ojo put away his penalty in fine style, with his ridiculously slow run-up and fantastic placement almost making a mockery of the United ‘keeper. 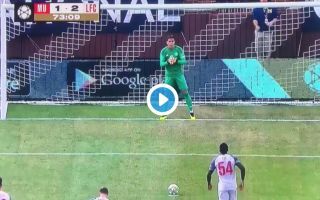 Here’s a clip of Ojo’s calmly taken penalty, one that surely puts the result beyond doubt for Jurgen Klopp’s side now.